Angus Forbes is giving a talk about his recent data visualization projects at DePaul University’s College of Computing and Digital Media research colloquium on April 13th. Our collaboration with Fontana Lab at Harvard Medical School, The Kappa platform for rule-based modeling, is accepted for an oral presentation at BioVis’18, part of the Intelligent Systems for Molecular Biology (ISMB) conference, and for publication in Bioinformatics. Intergalactic Medium Visualization (IGM-Viz), a collaboration with observational astronomer Joe Burchett of UCSC’s Astronomy & Astrophysics Department, is presented at the Arthur M. Wolfe Symposium in Astrophysics on March 26th in Big Sur, California. Our collaboration with Mihai Surdeanu’s Computational Language Understanding Lab at University of Arizona, Text Annotation Graphs: Annotating Complex Natural Language Phenomena is accepted to the Language Resources and Evaluation Conference (LREC’18). Visual music pioneer Larry Cuba is giving a talk on his computational films on March 6th at 3:30pm in PSB 110. Our collaboration with the CoNECt Lab, NeuroCave: A web-based immersive analytics platform for visualizing the connectome, is accepted to MIT Press’ Network Neuroscience. Charles Lingle, Won-jong Lee, and Manu Thomas from Intel’s Advanced Rendering Technologies are visiting UCSC Creative Coding on March 1st. Angus Forbes is giving an talk on immersive data visualization at UC Santa Cruz’ David Kirk Digital Scholarship Commons on February 20th. Our collaboration with Fontana Lab at Harvard Medical School, Dynamic Influence Networks for Rule-based Models, is published in IEEE Transactions on Visualization and Computer Graphics. The submission site for the SIGGRAPH’18 Art Papers track, chaired by Angus Forbes, is now live. (Long papers are due by January 16th; short paper by January 30th). Congratulations Manu! Manu Mathew Thomas has accepted a research internship position at Intel, and will be exploring applications of deep learning to real-time rendering. CMPM 163, Game Graphics & Real-time Rendering, is being taught by Angus Forbes on Tuesdays and Thursdays from 3:20pm to 4:55pm in PSB 110. Psionic is featured at MusicaAcoustica in Beijing, China on October 26th. Angus Forbes is introducing the Deep Illumination project at NVIDIA on December 12th in Santa Clara, California. Angus Forbes is giving an invited talk at VizUM 2017 on November 16th in Miami, Florida. Our collaboration with the CoNECt Lab, Baseline connectome modular abnormalities in the childhood phase of a longitudinal study on individuals with chromosome 22q11.2 deletion syndrome, is accepted to Human Brain Mapping. INVISO: A cross-platform user interface for creating virtual sonic environments, by Anıl Çamcı, Kristine Lee, Cody Roberts, and Angus Forbes, is presented at UIST’17 on October 24th in Quebec City, Canada. A user study of techniques for visualizing structure and connectivity in hierarchical datasets is presented by Tuan Dang at VOILA’17 on October 22nd in Vienna, Austria. The VISAP’17 schedule is now online. The program features a week of events, including the Sustain & Decay media arts and design exhibition, two papers sessions, the Dear Data Studio, and a tour of the Synthesis Lab at Arizona State University. Our collaboration with Fontana Lab at Harvard Medical School, Dynamic Influence Networks for Rule-based Models, is presented by Angus Forbes at IEEE VIS on October 3rd in Phoenix, Arizona. CMPM 290A, Visualizing Complex Systems, is being taught by Angus Forbes on Tuesdays and Thursdays from 11:40pm to 2pm in E2 258. The VISAP’17 Call for Submissions is now open. VISAP’17, chaired by Angus Forbes, Jeremy Boy, Yoon Chung Han, and Esteban Garcia Bravo, showcases innovative projects that explores novel intersections between art, design and visualization. The theme this year is Sustain and Decay; submissions to both the exhibition track and papers track are due on June 23rd. Congratulations Anıl! Anıl Çamcı has accepted a faculty position in the Department of Performing Arts Technology at University of Michigan. Congratulations Johnson! Johnson Keiriz has accepted a position as Senior Software Engineer at Toshiba Medical Research Institute. Congratulations Kyle! Kyle has accepted a summer internship position at HERE Technologies where he will devlelop software to analyze transporation and traffic data. Congratulations Kristine and Xing! Kristine Lee and Xing Li have accepted summer internship positions at Harvard Medical School, and will be working on biology visualization projects as part of an ongoing collaboration between Walter Fontana and Angus Forbes. Angus Forbes receives the 2017 UIC College of Engineering Faculty Research Award. Hai Tran’s work with the UIC Mathematical Computing Laboratory on developing games in virtual hyperbolic space is featured in Nature. Two multimedia works by Anıl Çamcı, Temas and Synthcity, are accepted to the International Symposium on Electronic Art (ISEA), and will be presented in Manizales, Colombia in June. Liz Marai and Angus Forbes are co-chairing the Workshop on Biological Data Visualization at the ISCB Great Lakes Bioinformatics Conference (GLBIO’17), which will take place in Chicago on May 15-17, 2017. Angus Forbes is selected to serve as the Art Papers Chair for SIGGRAPH 2018, taking place in Vancouver, Canada in August, 2018. Tuan Dang and Angus Forbes have two papers accepted to IEEE Pacific Visualization (PacificVis), to be presented in Seoul, Korea in April. Andres Puragto’s work on spatiotemporal brain networks is being presented at IEEE/EMBS International Conference on Biomedical and Health Informatics (BHI) in Orlando, Florida in February. Angus Forbes is visiting The University of Ohio’s Advanced Computing Center for the Arts and Design and giving a talk in the Department of Design on February 2nd. CS 523, Multimedia Systems, is being taught by Angus Forbes on Tuesdays from 3:30pm to 6pm in ERF 2068. Angus Forbes and Anıl Çamcı are hosting the UIC Technology Digitals Lunch, organized by Hannah Higgins, at EVL on November 11th. Congratulations Marco! Marco Cavallo has accepted a full-time data science position at IBM T.J. Watson Research Center (TWRC) in Yorktown Heights. Anıl Çamcı is performing his stochastic multimedia work, Temas, as part of the Oscillations series at the Experimental Sound Studio on November 12th. The VISAP’16 schedule is now online. The program features a week of events, including the Metamorphoses media arts and design exhibition, two papers sessions, the Critical Visualization panel discussion, and a tour of studios at MICA, the Maryland Institute of Contemporary Art. Dr. Bryan Pardo of Northwestern University’s Interactive Audio Lab is presenting a talk on “Rethinking Audio Production Interfaces” as part of the UIC Audio Engineering Society lecture series. Paul Murray, Fintan McGee, and Angus Forbes have a journal article accepted to BMC Bioinformatics, to be presented by Paul Murray at BioVis’16 during IEEE VIS on October 23rd. Angus Forbes is giving a talk at University of Texas at Dallas’ School of Arts, Technology, and Emerging Communication on September 26th. Anıl Çamcı is presenting two papers at the International Computer Music Conference (ICMC) in Utrecht, The Netherlands. Welcome Johnson! Johnson GadElkarim joins the Creative Coding Research Group as a post-doctoral researcher to develop new interactive visualization tools for biomedical data. Johnson has a background in electrical engineering, signal processing, and computer graphics, and is interested in exploring the intersections between medical imaging and mathematical modeling. He will also work with Dr. Alex Leow and the Collaborative Neuroimaging Environment for Connectomics. Congratulations Paul! Paul Murray has accepted a developer position at The New York Times’ Interactive News Desk. CS 424, Visualization and Visual Analytics 1, is being taught by Angus Forbes on Tuesdays and Thursdays from 3:30pm to 4:45pm in ERF 2068. The Creative Coding Research Group recieves a COE Annual Fund award to design and implement an ambisonic sound system. Through this award, we will create a state-of-the-art audio system to support research and applications related to spatialized 3D audio and virtual sonic environments. 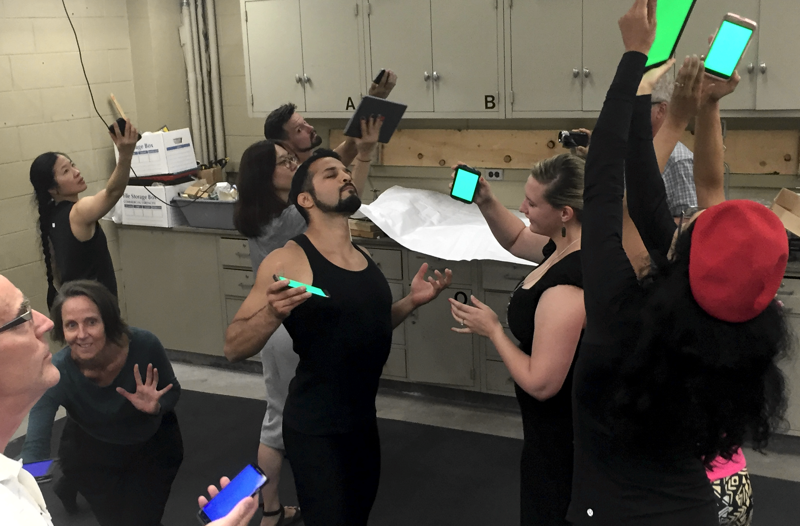 The artist Erica Mott visits the Creative Coding Research Group in mid-July for a week-long session to rehearse a new project, Mycelial: Networked Bodies. The project is inspired by the Arab Spring digital solidarity movement and aims to bridge the organic and digital ecosystems of organization and to understand collective living in a culture of instantaneity. The VISAP’16 Call for Papers and Artworks is now open. VISAP’16, chaired by Angus Forbes and Fanny Chevalier, showcases innovative artwork and research that explores novel intersections between art, design, and visualization. The theme this year is Metamorphoses. Submissions are due on June 24th. Congratulations Tuan! Tuan Dang has accepted a faculty position in the Department of Computer Science at Texas Tech University, to begin Fall 2016. Congratulations Marco! Marco Cavallo has accepted an internship position at IBM T.J. Watson Research Center (TWRC) in Yorktown Heights, New York over the summer. Anıl Çamcı has two papers accepted to New Interfaces for Musical Expression (NIME), to be presented in mid-July in Brisbane, Australia. Tuan Dang, Nick Pendar, and Angus Forbes have a paper accepted to EuroVis’16. The paper, titled “TimeArcs: Visualizing Fluctuations in Dynamic Networks”, will be presented in Gronigen, Netherlands in June. Angus Forbes is giving a keynote presentation at the ICTD 2016 Workshop on Innovation across Countries in Ann Arbor, Michigan on June 6th. Angus Forbes is visiting Northeastern University’s Information Design and Visualization graduate program on April 7th to discuss recent visualization projects. Angus Forbes is presenting an invited talk at the Festival on the Hill’s Symposium on Music, Science, and Nature on April 2nd at University of North Carolina, Chapel Hill. Congratulations Anıl! Anıl Çamcı has been awarded an ACM CHI artist grant to present his new artwork, Distractions, at Art.CHI Inter/Action, the ACM CHI 2016 Art Exhibition, curated by Ernest Edmonds and Jason Challas. Liz Marai, Angus Forbes, and Andy Johnson are presenting a paper at the IEEE VR Workshop on Immersive Analytics in Greenville, South Carolina on March 20th. Anıl Çamcı and Marco Cavallo both have papers accepted to the inaugural IEEE VR Workshop on Mixed Reality Art, to be presented in Greenville, South Carolina in March. Kyle Almryde and Brenda Lopez are giving a talk about their research in Learning Science to students at the Bernard Zell Anshe Emet Day School on January 27th. Kyle Almryde is attending the EduCoder’s mid-January retreat, a working group made up of researchers at UIC and the University of Toronto who are developing and implementing a new educational application called WallCology. Cem Cakmak, Anıl Çamcı, and Angus Forbes have a paper accepted to the CHI 2016 Workshop on Music and HCI to be presented May 7th in San Jose, California. Congratulations Paul! Paul Murray is a 2016 NSF ESP-IGERT Fellow for the Interdisciplinary Graduate Engineering Research Traineeship in Electronic Security and Privacy. Angus Forbes is a key personnel on “Making the West Side: Community Conversations on Neighborhood Change”, an NEH Humanities in The Public Square grant awarded to Jennifer Scott, Director of the Jane Addams Hull House Museum. Angus will serve as data visualization consultant, creating a dynamic, interactive map of Chicago’s West Side that will incorporate audio and visual primary source material. Angus Forbes is serving as a conference chair for Computational Aesthetics, part of the Expressive’16 joint program co-located with Eurographics in Lisbon, Portugal, May 7-9. Paper submissions are due on Febraury 7; abstracts are required the week before. Welcome Brett! Brett Balogh joins the Creative Coding Research Group part-time as a Visiting Researcher exploring novel interactive visualizations of the electromagnetic spectrum and communications networks. Welcome Tejus, Andrea, and Malvika! Tejus Bharadwaj, Andrea Purgato, and Malvika Kumar join the Creative Coding Research Group as MS students to investigate topics in dynamic network visualization and GPGPU programming. CS 491/DES 400, Creative Coding 1, co-listed in Computer Science and Design, is being taught by Angus Forbes and Daria Tsoupikova on Tuesdays from 4:00pm to 6:30pm in ADS 2400C. Angus Forbes and Paul Murray are visiting the The New York Times Research & Development group on Decemeber 17th. Marco Cavallo’s Team Italy is one of the winning teams for the Chicago Hackathon for Wildlife. Angus Forbes is awarded an Applications and Core Technology University Research (ACT-UR) grant from Keysight Technologies to develop novel visualization tools for electronic measurements. Anıl Çamcı is presenting his recent research on sound in virtual reality to the UIC Chapter of the Audio Engineering Society on December 3rd at 5pm. Anıl Çamcı is giving an invited talk at Northwestern University’s Interactive Audio Lab titled Unity of Musical Spacetime on December 1st at 1pm. William Chyr is visiting EVL on November 18th to talk about Manifold Garden, his architectural videogame project, and the artworks he created during its development. Angus Forbes is giving an invited talk in the School of Design at Universidad de los Andes in Bogota, Colombia on November 13th. 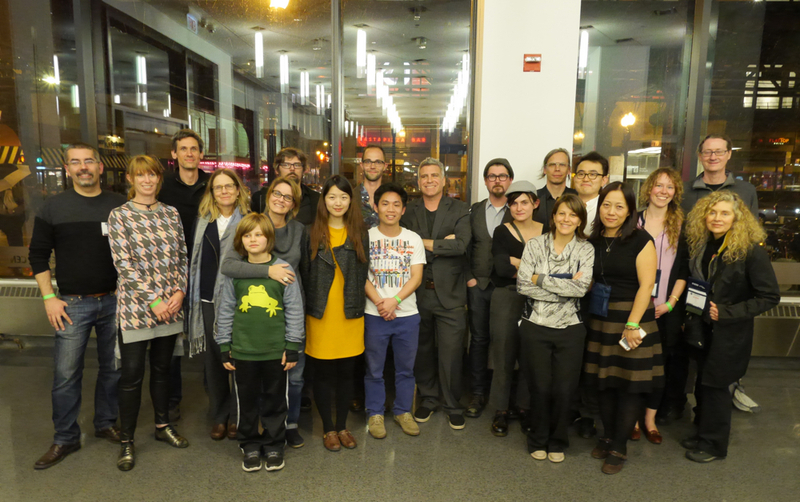 The Data Improvisations exhibition and VISAP’15 research presentations and artist talks were an enormous success! Thanks to everyone who participated and all of the organizers who made it happen! 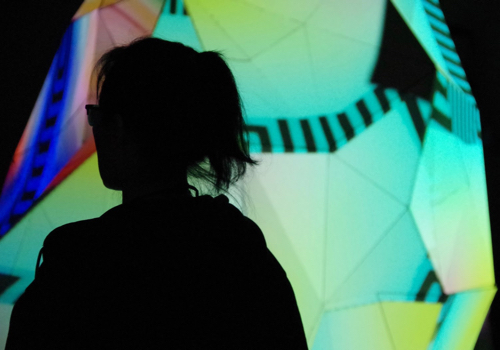 In conjunction with the VISAP’15 exhibition, Angus Forbes is moderating a panel at IEEE VIS titled “Creative Challenges at the Intersections of Visualization Research and New Media Arts,” featuring Eduardo Kac, Donna Cox, Dan Sandin, and Jo Wood. A paper by Alessandro Chetta and Angus Forbes describing novel interfaces for electronic health records is accepted to the Workshop on Visual Anaytics in Healthcare. The paper was written in collaboration with Jane Carrington of University of Arizona, and will be presented at IEEE VIS in Chicago, Illnois in October. Congratulations Kyle! Kyle Almryde and Angus Forbes are awarded Honorable Mention in “Visualize the Universe,” the 2015 IEEE Scientific Visualization Contest, for their submission, Halos in a Dark Sky: Interactively Exploring the Structure of Dark Matter Halo Merger Trees. Welcome Minh and Marco! Hoang Minh Huynh Nguyen joins the Creative Coding Research Group as a PhD student to work on projects in media arts and visualization; Marco Cavallo, visiting from Politecnico di Milano, will work on interactive projects for mixed and augmented reality. Massimo De Marchi’s research on the use of ambient displays for public transportation systems is accepted as a short paper to ACM SIGSPATIAL, to be presented in Seattle, Washington in November. The Creative Coding Research Group has a paper and a performance featured at the International Computer Music Conference in September. Anıl Çamcı presents research on interactive virtual soundscapes; Christopher Jette will perform a multimedia composition developed in collaboration with Kelland Thomas, Javier Villegas, and Angus Forbes. Welcome Anıl! Anıl Çamcı joins the Creative Coding Research Group in Fall 2015 as a post-doctoral researcher to investigate cross-modal narratives, generative audio, human-computer interaction, and multimedia design within mixed reality contexts. Tuan Dang and Angus Forbes’s collaboration with Nico Franz and Bertram Ludäscher is accepted to VOILA’15, the ISWC Workshop on Visualizations and User Interfaces for Ontologies and Linked Data, to be presented in Bethlehem, Pennsylvania in October. CS 526, Computer Graphics 2, a graduate seminar, is being taught by Angus Forbes on Wednesdays from 3:30pm to 7:00pm in EVL CyberCommons. Angus Forbes is a panelist for “Curating and Creating Electronic Works in Arts Contexts” at Electronic Literature Organization 2015, with Sandy Baldwin, Helen J. Burgess, Roderick Coover, Dene Grigar, and Mia Zamora. Giorgio Conte and Angus Forbes have a paper accepted to Brain Informatics and Health, to be presented in London the last week in August. The paper discusses a novel visualization technique to explore the intrinsic geometry of the human brain connectome and documents our collaboration with Allen Ye, Olusola Ajilore, and Alex Leow of the Collaborative Neuroimaging Environment for Connectomics. Angus Forbes and Paul Murray have a paper accepted to IEEE Computer Graphics and Applications. The paper, written in collaboration with Andres Burbano and George Legrady, introduces the Imagining Macondo project and will be featured in the Art on Graphics department, edited by Francesca Samsel and Bruce Campbell. 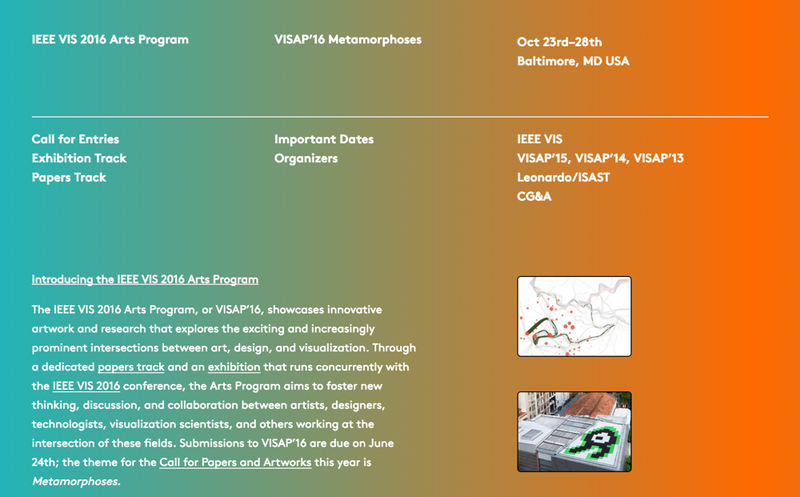 The VISAP’15 Call for Papers and Artworks is now open. VISAP’15, chaired by Angus Forbes, Daria Tsoupikova, and Fanny Chevalier, showcases innovative artwork and research that explores novel intersections between art and visualization. The theme this year is Data Improvisations; submissions are due on June 26th. Dr. Steve Haroz of the Visual Thinking Lab at Northwestern University is visiting EVL on May 27th to talk about his work on evaluating ISOTYPE visualizations. Congratulations Ronak! Ronak Etemadpour has accepted a faculty position in the Computer Science Department at Oklahoma State University, to begin Fall 2015. Congratulations Christopher! Christopher Jette was named a Grant Wood Fellow in Music and has accepted a position as visiting assistant professor at University of Iowa, to begin Fall 2015. Congratulations Francesco! Francesco Paduano has accepted a position at Dropbox in San Francisco, to begin Summer 2015. Angus joins The Collaborative Neuroimaging Environment for Connectomics (CoNECt@UIC) as an affiliated faculty memeber. CoNECt is an interdisciplinary team of researchers and clinicians devoted to improving our understanding of brain connectivity using novel techniques from neuroimaging and computational neuroscience. More infmoration can be found at http://brain.uic.edu. Angus Forbes has a paper accepted to ACM SIGGRAPH, to be presented during the arts paper track in Los Angeles in early August. The paper, titled Articulating Media Arts Activities in Art-Science Contexts, will also appear in a future issue of Leonardo. Angus Forbes is serving as the Arts Program chair of Expressive 2015. Expressive is the joint symposium on Computational Aesthetics (CAe), Sketch-Based Interfaces and Modeling (SBIM), and Non-Photorealistic Animation and Rendering (NPAR), and will take place June 20th through June 22nd in Istanbul, Turkey. Angus Forbes receives a College of Engineering Seed Funding Award to develop new visualization techniques to aid cancer researchers. Dr. Tamara Munzner of the UBC InfoVis Group is visiting EVL on April 9th. She will attend Visualization and Visual Analytics 2 in the morning and provide feedback for student projects. The Creative Coding Research Group has three papers accepted to BioVis 2015, the fifth Symposium on Biological Data Visualization, co-located with ISMB/ECCB 2015. Tuan Dang, Francesco Paduano, Paul Murray, Jillian Aurisano, and Angus Forbes will present their work in Dublin in early July. Chihua Ma has a short paper accepted to EuroVis’15, to be presented in Sardinia at the end of May. Angus Forbes is giving a talk at the Institute for Genomics and Systems Biology at University of Chicago on March 4th. Angus Forbes is part of a team of artists awarded a commission to create a new interactive installation for the 2015 Bogotá International Book Fair, premiering on April 22nd in Bogotá, Colombia. The project, Imagining Macondo, honors the work of Gabriel Garcia Marquez, and is developed in collaboration with George Legrady and Andres Burbano. Angus Forbes is on the organizing committee of the 2015 Workshop on Visualizing Taxon Characters, Taxonomy Alignments, and other Taxonomy Knowledge Products, which will be held at University of Illinois at Urbana-Champaign from May 11th-13th. Angus Forbes has a digital humanities paper and an interactive art installation accepted to the Electronic Literature Organization Conference, to be presented in early August in Bergren, Norway. Angus Forbes will present a talk on computational kinetic art at the 2015 International Kinetic Art Exhibit and Symposium on February 7th in Boynton Beach, Florida. Welcome Francesco, Massimo, and Giorgio! Francesco Paduano, Massimo De Marchi, and Giorgio Conte, all visiting from Politecnico di Milano, join the Creative Coding Research Group as research assistants to work on various information visualization projects related to systems biology, neuroimaging, and transportation. CS 524, Visualization and Visual Analytics 2, a graduate seminar, is being taught by Angus Forbes on Tuesdays and Thursdays from 9:30am to 10:45pm in EVL CyberCommons. Congratulations to Paul and Ronak! Paul Murray is awarded an NSF Travel Grant to ACM SIGSPATIAL; Ronak Etemadpour is awarded an NSF Travel Grant to IEEE BigData. Angus Forbes has a book chapter accepted to the forthcoming Cambridge University Press volume Deepening Teaching for Computational Creativity, edited by Michael Filimowicz. The Creative Coding Research Group has two papers accepted to IS&T/SPIE Electronic Imaging 2015, one to the Human Vision and Electronic Imaging conference, and the other to Visualization and Data Analysis. The papers will be presented in early Februrary 2015 in San Francisco, California. Tuan Dang has been named to the Organizing Committee for BioVis’15, serving as the Website Co-Chair. Paul Murray will present a demonstration of StretchPlot at the MapInteract workshop as part of ACM SIGPATIAL in Dallas, Texas on November 4th. Angus Forbes is a Co-PI on Jane M. Carrington’s NIH R01 grant, Enhancing Nurse Decision-Making via Augmented Communication Tools. His research contribution to this three year grant will focus on the design and implementation of interactive visualization tools that enable nurses to reason and communicate more effectively about patient data in clinical settings. A paper by Ronak Etemadpour, Paul Murray, and Angus Forbes is accepted to IEEE BigData. The paper evaluates the use of density-based motion for visualizing multidimensional datasets. It will be presented in Washington, D.C. in late October. Angus Forbes is appointed to the Leonardo Editorial Board as an Editorial Advisor. Javier Villegas and Angus Forbes’s paper discussing new approaches to video processing is accepted to ACM Multimedia. The paper will be presented in Orlando, Florida in early November. Paul Murray’s technique for exploring geotemporal trajectories is accepted as a poster at IEEE VIS 2014, to be presented in Paris, France in November. Welcome Tuan! Tuan Dang joins the Creative Coding Research Group as a post-doctoral researcher to work primarily on interactive visualizations of signaling pathways. Tuan is interested in developing visual analytics toos to enable users to derive insight from massive, dynamic, and ambiguous datasets. CS 488, Computer Graphics 1, is being taught by Angus Forbes on Tuesday and Thursday from 11am to 12:15pm in Stevenson Hall, Room 320. Kyle Almryde is the teaching assistant for the course. 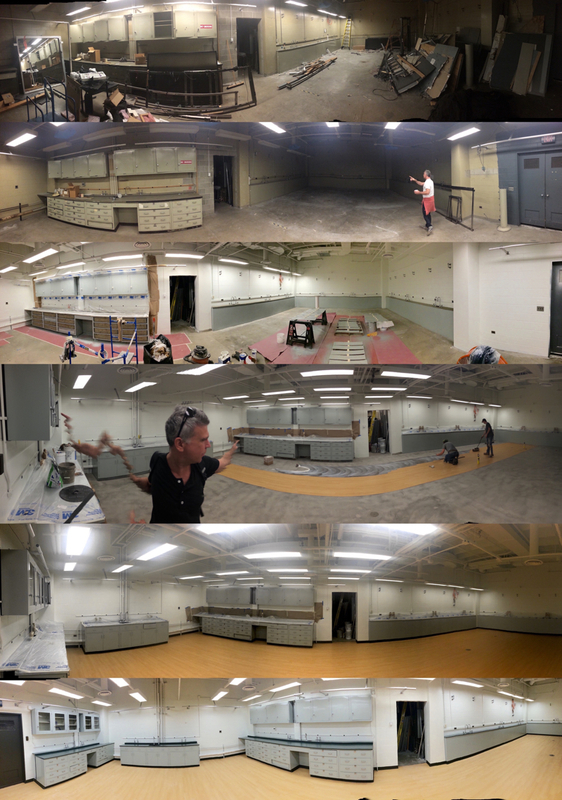 The Creative Coding Lab is relocating to University of Illinois at Chicago! Angus Forbes will be joining the faculty at UIC in Fall 2014 and will be affiliated with the Electronic Visualization Lab. CCL graduate students Kyle Almryde and Paul Murray will be starting the PhD program in Computer Science at UIC as well. Kelland Thomas will continue to teaching courses in Creative Coding and Computing and the Arts at University of Arizona. Angus Forbes is a Co-PI on Mihai Surdeanu’s DARPA Big Mechanism grant, Reading and Assembling Contextual and Holistic Big Mechanisms. His research contribution to this three-and-a-half year grant will focus on the interactive visualization of hierarchical networks for systems biology. Researchers from the Creative Coding Lab have a paper accepted to the 2014 joint International Computer Music Conference (ICMC) and Sound and Music Computing Conference (SMC). The submission, Translation as technique: Collaboratively creating an electro-acoustic composition for saxophone and live video projection, by Christopher Jette, Kelland Thomas, Javier Villegas, and Angus Forbes, will be presented in September in Athens, Greece. Kelland Thomas receives a $10,000 equipment grant from the University of Arizona to purchase new technologies for the Creative Coding Lab and SISTA Computing and the Arts courses. Javier Villegas will be his displaying interactive work, Herbaceous, at the 516 Gallery as part of the Digital Latin America Exhibition in Albuquerque, New Mexico from June 7th through August 30th. ISTA 497A, Multimedia Programming with Max/MSP, is being taught by Christopher Jette in the Summer 2 session on Tuesday, Wednesday, and Thursday, from 1pm to 4pm. ISTA 303, Introduction to Creative Coding, is being taught by Kelland Thomas on Monday, Tuesday, Wednesday, Thursday, and Friday from noon to 1:45pm during the Summer 1 session. ISTA 301, Computing and the Arts, is being taught by Kelland Thomas on Monday, Tuesday, Wednesday, Thursday, and Friday from noon to 1:45pm during the Summer 2 session. Congratulations Paul and Kyle! Paul Murray and Kyle Almryde are both accepted as PhD students in the School of Information for Fall 2014. Angus Forbes is co-chair for the IEEE VIS 2014 Arts Program. The theme for this year’s Arts Program is Art+Interpretation. For more information about how to submit an artwork or paper, go to http://visap2014.sista.arizona.edu. Kyle Almryde is creating a visualization of the neural response rates of visual centers within the human brain for the Interactive Expo of Excellence during the 2014 UA Campaign Kick-off. The visualization will illustrate research by Dr. Paige Scalf of the Visual Cognition Lab. Javier Villegas is presenting his work to the Interactive Games and Media department at the Rochester Institute of Technology on April 11th. Congratulations Shloka! Sholka Desai has been accepted to a summer internship at Google, where she will work with a team focused on creating visualization projects. Javier Villegas and Angus Forbes have a series of projects, Abstract Mobile Mirrors, accepted to Currents 2014 to be presented at El Museo Cultural de Santa Fe in Santa Fe, New Mexico. A paper co-authored by Angus Forbes and Shloka Desai, in collaboration with researchers from UC Santa Barbara, Visual Analysis of Targeted Audiences, is accepted as a paper at the International Conference on the Design of Cooperative Systems (COOP), to be presented in May. Interactive Non-Photorealistic Video Synthesis for Artistic User Experience on Mobile Devices, by Javier Villegas and Angus Forbes, awarded Best Paper at the International Workshop on Video Processing and Quality Metrics for Consumer Electronics (VPQM). Javier presented the paper in Scottsdale, Arizona on January 30th. Kyle Almryde, Javier Villegas, and Angus Forbes have a paper accepted to IS&T/SPIE Stereographic Displays and Applications XXV, to be presented in San Francisco during the International Symposium on Electronic Imaging: Science and Technology in early February. The paper presents the 3D+Time Brain View, an application to visualize brain activity clusters that change in response to linguistic stimuli. The work is a collaboration between Dr. Elena Plante’s Speech, Language, and Hearing Lab and the Creative Coding Lab. 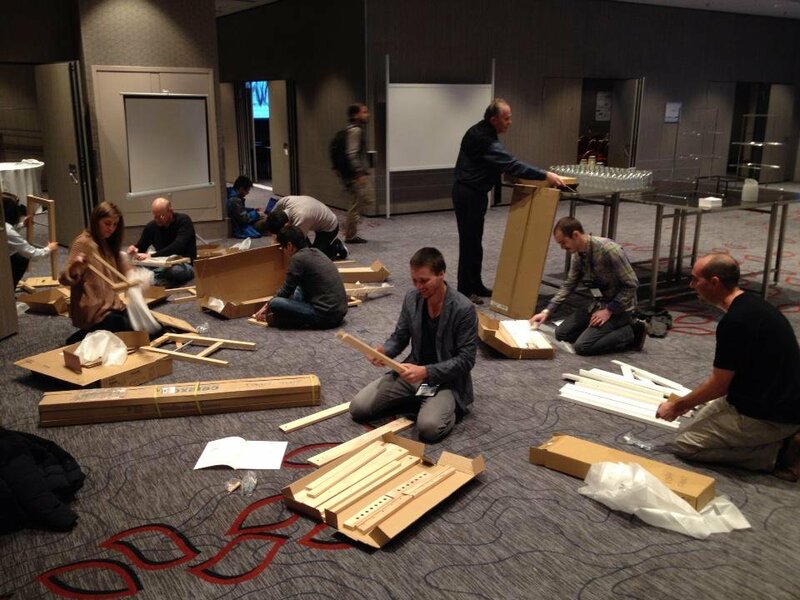 Angus Forbes is the posters & demos chair for Expressive 2014, co-located with SIGGRAPH in Vancouver, Canada. Expressive is the joint symposium on Computational Aesthetics (CAe), Sketch-Based Interfaces and Modeling (SBM), and Non-Photorealistic Animation and Rendering (NPAR), and will take place August 8th through August 10th. Weekly meetings for the Creative Coding Lab are being held on Wednesdays from 2pm to 4pm in GS 813. ISTA 416/516, Human-Computer Interactions: Designing Pragmatic Experiences, is being taught by Angus Forbes on Tuesdays and Thursdays from 2pm-3:15pm. ISTA 303, Introduction to Creative Coding, is being taught by Kelland Thomas on Tuesdays and Thursdays from 3:30pm to 4:45pm. ISTA 301, Computing and the Arts, is being taught by Kelland Thomas on Mondays and Wednesdays from 5pm to 6:15pm. The School of Information is now accepting applications for the graduate program in Information. Students interested in research within the Creative Coding Lab can apply at either the Masters or the PhD level. Applications are due January 31st, 2014. Contact Dr. Angus Forbes for more information. 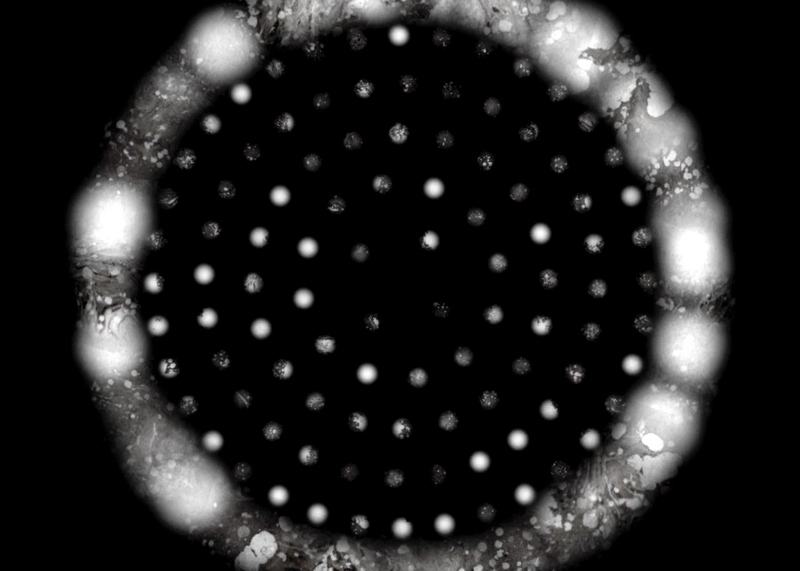 An article in the Institute of the Environment’s online magazine, Proximities, featuring work by Angus Forbes, discusses the use of art and visualization techniques to represent complex environmental issues. Ronak Etemadpour has two papers accepted to IVAPP 2014, the International Conference on Information Visualization Theory and Applications in Lisbon, Portugal in January 2014. Christopher Jette, Kelland Thomas, Angus Forbes, and Javier Villegas present Sound-Worlds at Exploded View Microcinema on November 15th at 8:00pm. Christopher Jette and Kelland Thomas present v->t->d at the Confluencenter for Creative Inquiry’s “Show and Tell” at the Playground in Tucson on November 13th at 5:30pm. Ronak Etemadpour discusses Human Perception in Using Projection Methods for Multidimensional Data Visualization at the Interdisciplinary Computational Intelligence Seminar on November 8th in GS 906 at 1:30pm. Angus Forbes gives a talk, titled An Overview of Current Topics and Themes in Visualization, at the Interdisciplinary Computational Intelligence Seminar on October 25th in GS 906 at 1:30pm. Javier Villegas presents a talk, Interactive Abstract Mirrors on Mobile Devices, at the Mobile Matters Symposium on October 21st. Welcome Ronak! Ronak Etemadpour joins the Creative Coding Lab as a post-doctoral researcher. Ronak‘s research interests include information visualization, perception, and human-computer interaction. Angus Forbes is a Co-PI on Eric Lyons’s USDA AFRI grant, iAnimal: Cyberinfrastructure Enabling Animal Breeding, Genetics, And Genomics, to develop novel visualization methods for comparative genomics. Angus Forbes’ collaboration with Mihai Surdeanu and Peter Jansen (SISTA NLP) and Jane Carrington (UA Department of Nursing), the paper titled Transmitting narrative: An interactive shift-summarization tool for improving nurse communication, is accepted in the IEEE Workshop on Interactive Visual Text Analytics. Javier Villegas gives a talk, titled An Analysis-Synthesis Approach to the Creative Processing of Video Signals, at the Interdisciplinary Computational Intelligence Seminar on September 6th. Turbulent World, an interactive piece by Angus Forbes, is featured in the “Brave New World” show curated by OFF Space. The show is held at the Spare Change Artists Space in San Francisco and opens on September 19th. The Creative Coding Lab has two research papers accepted in the 2013 Re-new digtal arts festival proceedings in Copenhagen, Denmark. Angus Forbes’ collaboration with the data scientist Tony Fast (Georgia Tech), entitled The Natural Materials Browser, is accepted as a poster into IEEE VIS 2013. Fluid Automata Performer 1.1 is released for iOS devices. It adds a host of features to original version of Fluid Automata and enables its use in performance situations. Weekly meetings for the Creative Coding Lab are being held on Wednesdays from 3pm to 5pm in GS 821. Angus Forbes is offering independent studies for Fall 2013 in Interactive Data Visualization, allowing students to explore current and seminal topics in information visualization and scientific visualization. ISTA 352, Images: Past, Present, Future, is being co-taught by Professors Kobus Barnard and Angus Forbes. ISTA 301, Computing and the Arts, an introduction to historical and current practices of media arts, is being taught by Kelland Thomas. Angus Forbes is co-chair for the IEEE VIS 2013 Arts Program. The theme for this year‘s Arts Program is Art+Experiment. For more information about how to submit an artwork or paper, go to http://visap2013.sista.arizona.edu. The Creative Coding Lab has two submissions accepted to the International Symposium on Computational Aesthetics in Graphics, Visualization, and Imaging, co-located with ACM SIGGRAPH in Anaheim, California. Welcome Javier! Javier Villegas joins the Creative Coding Lab as a post-doctoral researcher. Javier’s research explores the narrative and creative possibilities of analysis and synthesis techniques in video signals. Javier received his PhD at UC Santa Barbara under the direction of the artist George Legrady. Mingyui Kevin Chau receives a graduate fellowship from the Confluencenter for Creative Inquiry to explore the pedagogical visualization of contemproary classical music. Angus Forbes presents a talk, Expanding the Creative Possibilities of Mobile Devices, at the Mobile Matters Symposium on March 29th. Christopher Jette’s piece Ordered Table for toy piano and electronics was premiered by Keith Kirchoff at Third Life Studio in Somerville, Massachusetts on April 27th. Christopher Jette’s piece FeedbackTree for trombone quartet was premiered by Guidonian Hand as part of the Contagious Sounds Series at the Gershwin Hotel in New York City on March 26th. Angus Forbes gives a presentation on Creative Sensing, April 11th at Mobility 20x20, a PechaKucha organized by Beth Weinstein. Angus Forbes presents a talk, titled Dynamic Visualization: Explorations of Motion and Representation, at the UA Computer Science Research Colloquium on April 23rd at 11am in GS 906. Multiple Water, an interactive art piece by Angus Forbes installed on a multitouch table, is shown at Form, Content, & Computation, an exhibition of multimedia computational art created by students and faculty at the University of Arizona. The mutli-touch table was built by Matt DePorter, and undergraduate ISTA 401 students Andrew Fortner and Nathan Fitzgibbon helped in the installation. Welcome Christopher! Christopher Jette joins the Creative Coding Lab as a post-doctoral researcher. Christopher’s compositions and research address the intersection of technology and human interaction in creative and performative arenas. 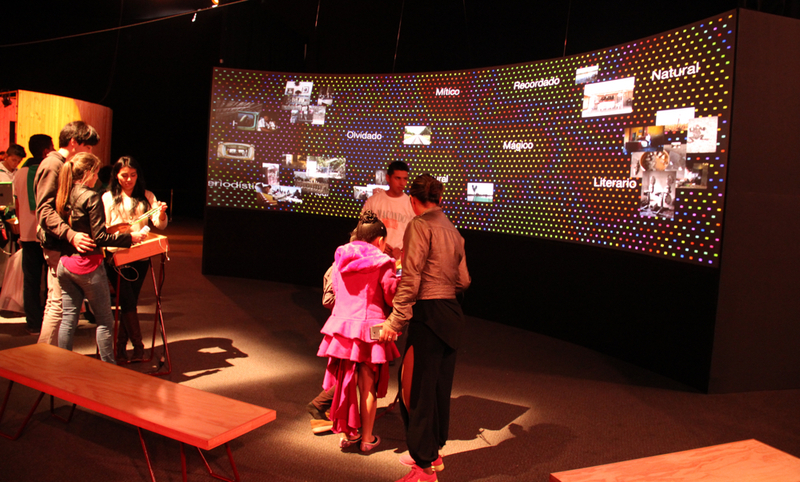 ISTA 401, Multimedia Installations, is being offered to upper-level undergraduates.